I am grateful to my fellow blogger Persolaise, whom I met when our paths crossed in London, and to Grant Osborne of Basenotes, for respectively doing and publishing an interview of me on a site I consult regularly (to read it, click here). One of the pleasures of this virtual scented world is the encounters it yields in real life: several of my friends in Paris are people I met through it, as are practically all of my London friends, and in both capitals, I’ve had the chance to catch up with people coming in from abroad. I’ve never been disappointed by those encounters and the charming, thoughtful and handsome Persolaise was no exception. I will next be in London from December 14 to 17 for a course at the London College of Fashion that is open to the general public. There are still a few places to book: the more in advance I know how many people will attend and what their profiles are, the easier it is for me to tailor my syllabus to their level and interests, so don’t hesitate to contact me if you have any questions. To Persolaise and you congratulations for the dynamics of this interview. It gives us a rare opportunity to realize that individuals and their approach to things are crucial. I agree with the point that if everybody would have a blog the arena for discussion,and for learning, would be reduced, significantly. Some blogs have solved the issue by having guest bloggers write some posts. But then, as is the case with you (and with Octavian Coifan) the strong personal chord would be lost. If fragrance is art - and it is - then the critique and evaluation should stand up to the challenge.This interview does. EEM, I hesitated before making that comment on the multiplication of blogs, because I realize it can be misconstrued or found hurtful -- and I don't want to come off as the "old guard", which I'm not, dissing newcomers (who may actually have been following the scene for a long time, not that it matters particularly). The optimisitc part of me takes the "more the merrier" stance: the more people are passionate about fragrance, the more people will be "converted" and thus, buy more creative fragrances, supporting the worthwhile niche houses or the best mainstream launches, encouraging the industry to put out better products... I'm hoping that's the way it will work out! Another point of annoyance is seeing non-perfume blogs moving in on the territory in total ignorance of the field: they're much easier to manipulate by the brands, and being more widely read because they usually focus on fashion or beauty, spread the marketing discourse with no critical stance. We've seen it with mainstream launches like Belle d'Opium and with niche products such as the latest Juliette has a gun. As I said on Basenotes, it's all moving so fast it's hard to see where all of this is going... The internet is the Far West! I wish I was closer and it were easier for me to take part in one of your courses, I love how you described the discussion it generates - as your blog does as well. I agree, that is the best way to learn more about perfume because one person can never come up with all associations and ideas a healthy discussion generates. And yes, the blogs are proliferating at an amazing speed but I think it's easy to distinguish (at least for me) those who have serious knowledge of the subject, those who love perfume and write about it as afficionados and those who have no real content regarding what something smells like and how it rates as a succesful perfume. 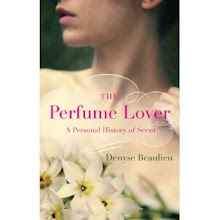 Wonderful interview Denyse. I've only been visiting your blog for a short time but I find myself returning regulary because I appreciate your writing and your opinions. My interests lie in history and the industry as a whole though I lean toward naturals. Your reviews help me to expand my knowledge, setting me on a course to research more. In regard to the remark about your responding to every comment, that is one of the reasons I kept returning when I was first introduced to Grain de Musc. PS: I meant that in terms of writing for blogs, not reading them. I can't stop reading the good perfume blogs, just too compelling! Congratulations and Well deserved article. i think which blog you're talking about, it is like a mega PR project, although I feel unconfortable talking about someone without naming him. I read mainly four blogs at the moment, and find the distinct voices and points of view very interesting. One of the reasons I never left Grain de Musc after visiting it for the first was the intensity of the dialogue you engage in. Ines, that's one of the things that strikes me the most when I give my "adult" courses: the interaction they generate, with everyone bringing their professional competences to the table, even the non-connoisseurs who came out of curiosity. And who often have striking insights after just a few hours! Lisa, of course if I had as many comments as Now Smell This and the Perfume Posse it would be a superhuman task. But the point I find is discussion and whenever it can be fostered I'm paid back for the extra effort. As I said in the interview, I've drastically reduced my browsing too, much in the way that I'm editing the number of products I sample. I'm sure I'm missing marvellous stuff, but I find too much information interferes with my thought processes. When you're writing (I mean the book), I find you need to be much more cautious about what you let into the mind. Well, it's actually the study of stellar structure and solar "weather", similar in some ways to the study of tropical meteorology. No idea how I got from there to perfumes....And yeah, there are some hay-wacky interviewers out there, but you chose a good one! Now I know why my ears have been burning for the last few hours!! Thanks very much indeed to everybody for all the kind comments and compliments. Re: the proliferation of blogging. Now that I'm no longer obliged to wear my interviewer's hat, I hope I may be permitted to express my own opinion. I share everyone's concerns on this matter, despite the fact that I'm one of the relative newcomers to the perfume blogosphere (although I have been blogging under a few other secret identities and on other subjects for quite a few years). I sincerely believe that the dust will settle and genuine perfume lovers will be able to distinguish between quality and dross. Maybe the perfume industry will become similar to the film industry: mainstream on the one hand, arthouse on the other, with a few stragglers in the grey area in the middle. As for the divorce between mainstream and arthouse, judging from the last French Fifis, which *did* set up awards given out by connoisseurs alongside the ones voted on by the general public, it has already been almost entirely consummated. Thanks very much for that, Denyse: I wasn't aware that the Fifi's had started parting the seas. And yes, I know what you mean about the faux-niche. A topic for a future blog post for you, perhaps? Persolaise, that's just the French Fragrance Foundation -- the other ones are much more mainstream, you'd be astounded at what they consider to be niche! As for doing a subject on the faux-niche, I did a post a while back. One knows, isn't it? The syntax, the inflexion of the voice in the text, the choice of subject matter - some blogs look 'invented', like all bad writing. Soul-less metonymies of 'beauty', neologisms around the word scent, etc. Nearing the end of Dostoevsky's Crime and Punishment, Raskolnikov says that a time will come when everybody will feel like a prophet, imbued with a false certainty in what he/she knows, and everybody will expose their opinions, without listening. But if we do listen, we can discern between real and forged. We are entitled to quality, and entitled to demand it not only in fragrance. No snobbery involved, one just follows a trail, an intuitive sense about quality, and if it is no there, well, why bother? EEM, there are a few authors that seem to contain, not a world, but THE world, and Dostoievsky is one of them. The difference though is not only between real and forged, or sincere and insincere (though sincerity can be just as dangerous as insincerity). It is between original and copy/paste, demonstrable/debatable and "everyone's opinion is equally valid because it's all subjective". The prevalent dogma of "everyone's entitled to their opinion" (which is true and legitimate) too often morphs into the latter, at which point there is no real discussion because, as you say, no one is really listening anymore. I hasten to say I don't believe this is the case in the discussions fostered in this venue. Hello, Denyse. I enjoyed the interview, and also the photos from your course. I agree with you about the proliferation of blogs, although I suppose it's part of the larger context of blogging and social networking, where everyone feels entitled to have an opinion (and voice it). I tend to think, on balance, that this is not such a bad thing: it certainly gives opportunities for a wide variety of view points to come out, although, as you point out, there is also wide variation in the quality of the commentary. More disturbing to me is the increasing influence of commercial interests, which, in the end, will probably quash substantive conversation and debate. In the end, I fear that it will not be quality writing that will rise to the top, but rather slick marketing, and that would be unfortunate. I enjoyed Persolaise's insightful interview very much, and have also commented over on BN in the guise of my other, civet-averse persona. As a relatively new blogger - and perfume enthusiast - myself, I have followed the "mushrooming blogsphere" debate with interest, and I can relate to the genres you evoke of "slick newsletter" and "beauty blog shunted sideways". I am well aware of the limitations of my own knowledge and nasal faculties, and am careful to preface anything I post as a "review" with a disclaimer, referring readers to you or Octavian or Robin for a more authoritative take on the scent in question. I would not wish to mislead an unknown audience in just the manner you fear may be occurring. Blogging does come with a responsibility - you never know who might be influenced by a chance, ill thought out remark. Vanessa, the first prominent perfumer I met, when I asked him about whether there was a given material in one of his compositions, replied: "If you smell it, it's there". Historical or technical facts can be gotten wrong and be perpetuated: an olfactory "reading" is just that, an interpretation, and if it's not a copy/paste, is entirely legitimate whatever the impressions, provided they go past "ick/wow". 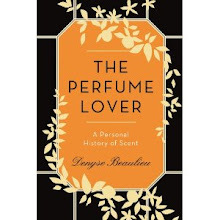 The perfumer's comment you report: "If you smell it, it's there" was an eye opener to me. I assumed that there was some leeway for subjectivity, but not to that extent. And that anyone who couldn't describe a perfume's trajectory in some detail, isolating the key notes in more or less the correct sequence, had better not bother. You have emboldened those of us whose noses are more of a blunt/untrained instrument to carry on with our fuzzy, impressionistic style of reportage, provided - as you say - it is not second hand or confined to empty kneejerk responses. Vanessa, perfume is ultimately made to be worn, and the stories we tell ourselves about it add new layers of meaning to it, don't they? Everyone's got different associations; the brain will pick up one bit of an olfactory signal and auto-complete it according to your personal olfactory library. This is why perfumers spend so much time discussing between themselves, and with the people they work with/for, so that when they say a word, they know the word means the same thing for everyone. It's also why there is so much discussion on the blogs and boards: to adjust the language. The interview included everthing that makes a blog interesting- it wasa well written, content that requires a little reflection, inspires me and provokes a conversation with a friend with similar interests. I know there are lots of new blogs but they shouldn't all be dismissed solely by being new kids on the block. i would point to the scent and sensibility which includes writing of real quality from Ronny and Richard with the occaisional comment from Persolaise himself. Maureen, far from me from dismissing bloggers who are "new kids on the block", I'm not one of the pioneers either. It's just harder to find your way through the thicket, to things that speak to you.